Apparently, GQ, The Satorialist, and every other major mensware blog did not dispatch a photographer to capture Super Bowl XLVI street style. But while on our couch watching the big game that lacked big plays (besides the Manningham special), we observed some Super Bowl related style. 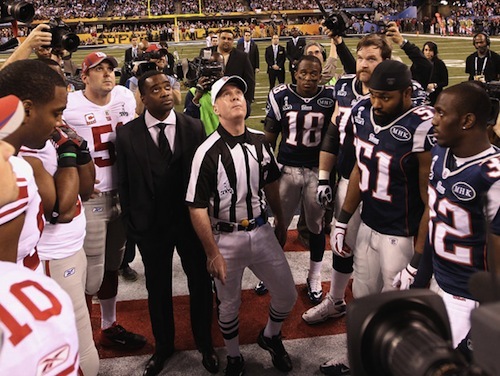 Some of it was pretty bad, but we managed to pinpoint one winner: Coin Flip Connoisseur Curtis Martin. 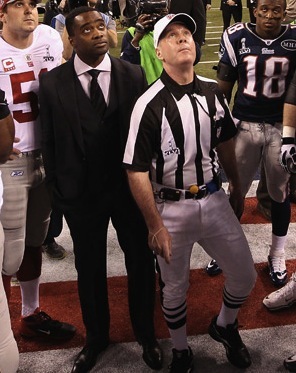 Curtis Martin looks like he wandered from wedding reception to midfield at a football stadium. And that's not a bad thing. Martin looked lik a stylish attendee at a semi-formal opera — or perhaps just a stylish pall-bearer — by wearing a black three-piece suit with a white shirt. His collar is the real attention grabber here, a thick spread job that looks big enough to drape a linebacker’s shoulder pads. A spread collar dress shirt from Boss Black. Perfect not guaranteed. Now, spread collars are to Martin’s wardrobe what thousand-yard rushing seasons were to his career. It’s just how the man gets down. Spreads are great for guys with fuller faces, but narrower heads can pull them off as well. 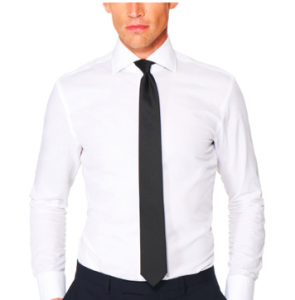 If you’re looking for a shirt similar to Martin’s, try this white spread collar one from Boss Black available at Park and Bond for $115. Of course, there are some more affordable options too. If you’re looking for something in the $75-$100 range, try J Crew. They have a white spread collar for about $80. And if you want something even less strenuous on the wallet, try this Calvin Klein spread. It’s about $33 online at Macy’s if you buy it on February 8. Regular price is around $65. Of course, you can always try H&M too. Most of their dress shirts are about $40, and they usually have a white spread option (not to be confused with Rich Rodriguez, the white guy in college football who runs the spread option offense). 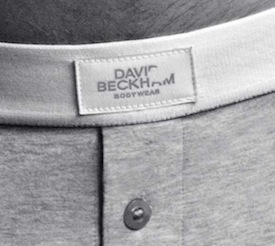 Also, if you’re at H&M we cannot in good conscious recommend buying any David Beckham brand underwear. There’s something unseemly about having that man’s name on an elastic band three inches above our junk. A name we'd rather not see every time we hit the head.